A cozy village located north of Montreal called Saint-Donat hosts the remains of an aviation horror story. In October 1943, a Liberator III crashed atop Black Mountain during a routine flight, killing all 24 people aboard. The wreckage remained lost in the woods for two years after the accident. It’s believed a mix of bad weather and a mapping error led to the crash, which is said to be the worst accident in Canadian military aviation history. Black Mountain’s height had been accurately recorded on the map, and it’s likely the foul conditions prevented the pilot from spotting the looming landmass until it was too late. 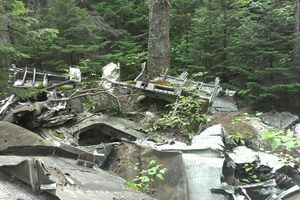 Though locals reported hearing the plane crash into the mountain, it took more than two years to find the wreckage. Authorities first turned to the Saint Lawrence River, believing the aircraft was sunk within its depths. The wreck of the Liberator III wasn’t found until June 1946. Its discovery was actually an accident, as the authorities had been searching for a different missing plane. After a pilot noticed the mangled metal glinting in the sun, a search party set off on foot to trek through the woods. They kept their eyes to the sky as they walked. Above them, a plane continually nosedived toward the ground to indicate the location of the wreck toward which they should head. Today, a roughly 7.5-mile trail up the mountain leads to the crash site, where walkers can go to contemplate the debris from the crash. There’s also a monument commemorating the lost passengers nearby.